I recently met Julie Jarvis of REALthings and we shared a tea that happily turned into a morning of connection. One of the many joys of honing a meditation practice is the opportunity to meet great people along the way. Julie has created cushions for meditation practices that are beautiful, ethically sourced and created, and a delight to use. For many people who put meditation time into the middle of the day, even at work as a mindful recalibration and reconnection to authenticity and personal well-being, her chair cushions are an amazing innovation. I’m pleased to be able to offer you a connection to Julie and REALthings. She has the ability to properly fit you for an assistive meditation posture. I’d encourage you to contact her directly to learn more. Are you sitting comfortably? How to choose a good cushion and how your posture affects your meditation practice. The most common image of meditation is the one you’ve likely seen many times: a peaceful looking person sits comfortably, legs crossed in the lotus position, eyes closed and brow perfectly smooth. The problem with this picture? The lotus position isn’t possible for everyone. And while it may be an ideal position for grounding and supporting the body, it isn’t the only way. There are many different postures you can use to get this grounding support. The key is finding the right cushion or prop to support your body in the position you choose. Ideally, to sit with a straight, relaxed spine, it’s best to position your hips higher than your knees, which allows the pelvis to roll forward slightly and the spine to float upwards. To achieve this, you’ll want to choose a cushion shape and height that raises your seat off the ground and allows your knees to lower toward the floor comfortably. For some people, having a cushion or prop under their knees, ankles or hands helps support posture and stability. For others, the only way to achieve this is sitting on a chair. In many traditions meditators sit on cushions on the floor because sitting on the floor can be a deeply grounding and stable way to meditate. Many people I sit with believe that they need to be flexible or that they are going to become more flexible if they meditate. This is especially true of people who have lost flexibility due to age, injury or illness. While increased flexibility may be the outcome of a regular meditation practice, this belief can also prevent people from meditating or asking for support to find the right posture and cushions to begin or continue their practice. The best practice is to begin where you are now, with the body you have now and see where the practice takes you. Everyone’s body is different, so the best way to find out what works for you is by experimenting. When I sit with people I invite them to try different types and sizes of cushions and alternative positions, like kneeling or sitting on a chair. I advise them to try cushions and stay in positions that support them well for at least 15 minutes, preferably longer, to see if any chronic or serious pains arise. 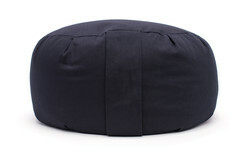 The most common and popular sitting cushion is the zafu. The name zafu comes from Japan and means sewn seat or sit cushion. In Japan, the zafu is placed on top of a large square floor cushion called a zabuton. Together, they create an ideal sitting space, providing warmth and cushioning for the hips, seat, knees and ankles. The important considerations with a zafu are its height, size, and its stuffing. Traditionally, zafus were stuffed with a natural fibre called kapok, but now the most popular ones in North America are filled with buckwheat hulls, which are more malleable. The body’s position is also important with the zafu. It is best to sit at the front edge of a round cushion so that the pelvis can roll forward and the knees can lower toward the ground. If it is difficult to sit cross-legged, you can try straddling the cushion flat or turned on its side. Semi-circular cushions are a variation on the zafu. These are very helpful for people who need support where the hip joint connects to the upper thigh as well as under the knees. Oblong-shaped cushions and bolsters offer an alternative for people who prefer more width under the hips. 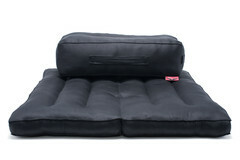 They are perfect for people who also want to use their cushion as a bolster for yoga postures. Pictured above with a folding Mat to cushion the knees and ankles, the bolster/brick lifts the hips and allows the pelvis to roll forward naturally. Zabutons are large floor cushions that are normally used under a zafu, bolster, bench or a brick. 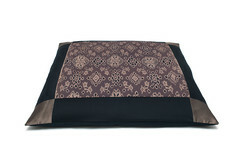 This large cushion provides warmth and cushioning for the hips, seat, knees and ankles. A plush carpet or blanket may also be used as an alternative. If your hips or knees hurt when you sit cross-legged on a cushion, or if your feet or legs fall asleep, knee cushions can help. Use them to lift up one or both of your knees. This will take the stress off the knees and hips and keep the feet and legs from feeling pain or falling asleep. Knee cushions, blankets, bricks and towels and clothing can all be used for this purpose. If you have a long torso and shorter arm length, you may want to consider a hand cushion — a small soft, thin, cushion you can place in your lap. It lifts and supports the hands, relieving pressure in the shoulders so the body does not pull forward. If sitting cross-legged is difficult, a meditation bench is a great alternative. Benches come in different heights and widths and may be covered or have a cushion. Collapsible meditation benches have folding legs which make them easy for transport and travel. Meditating in a chair is becoming an increasingly popular posture for those who aren’t inclined to sit on the floor. Chair meditation is easy and accessible though finding a supportive posture can be challenging. If you want to avoid having your pelvis tip backward causing your lower back to slump in the chair, you can use cushions under your seat or behind your back to help the pelvis roll forward and the spine straighten comfortably on a chair. Whatever you cushion choose, make sure it supports your body and your practice. 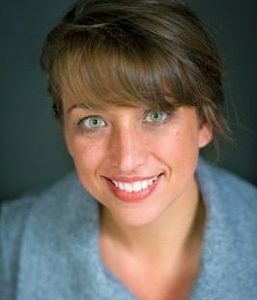 Julie Jarvis is the founder of REALthings, a socially conscious and respectful meditation cushion company that makes high-quality meditation and yoga cushions that help alleviate pain and physical barriers to a regular mindfulness practice. Julie offers private and group cushion ‘sitting fittings’ to make sure every customer gets the right ‘sit’!